The Whole Enchilada. Las Palmas was originally conceived in 1922 in Ventura, California, by a talented Mexican housewife named Rosa Ramirez. Rosa started making her delicious "enchilada sauce" from an old and traditional family recipe she refined, using carefully selected hand-picked "chiles" and other ingredients of the finest quality and freshness. Her flavorful sauce became an instant hit among her neighbors and friends. Encouraged by this success, Rosa moved beyond the confines of her kitchen and founded the Ramirez & Feraud Chili Company. Today Las Palmas is the biggest selling Mexican cooking sauce in the United States. While it has grown from its humble beginnings, it still remains authentic to its roots, using only the highest quality chiles and other fresh ingredients. 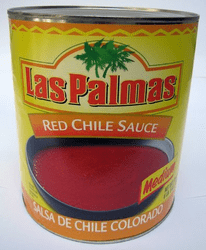 Las Palmas offers a wide variety of Mexican cooking sauces including Red and Green Chili Enchilada Sauce, Red Chile Sauce and Hot Enchilada Sauce plus other Mexican cooking staples Green Chile's and Crushed Tomatillos. La Salsa para enchiladas de Las Palmas es deliciosa para cocinar sus deliciosos platillos de la comida Mexicana. I use this to make Posole it is the best you can buy for this.short of making it from scratch and it no better I have tried.